Constantly keep your eyes open when wandering round the old City of London. Behind the steel and glass and beneath your feet are about two thousand years of history. Reminders of the past are everywhere – some obvious, others not; and some are real hidden gems. 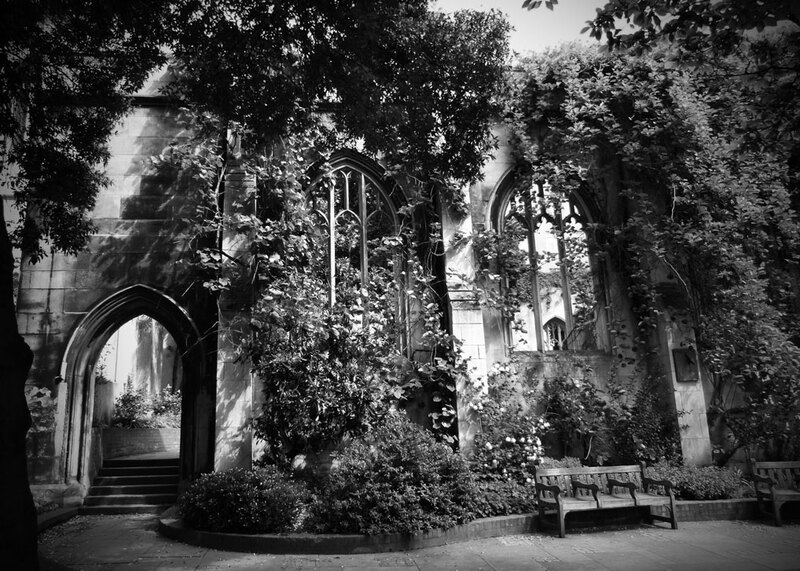 One of the finest of those hidden gems is St Dunstan in the East. It sits at the junction of St Dunstan’s Hill and Idol Lane (originally Idle Lane), an easy 5-10 minute walk from either Monument or Tower Hill, and is one of more than a hundred churches that used to occupy medieval London. As you approach, it would be easy to think that something is wrong; the building is overgrown, hidden like something from a legend, with climbing plants festooning themselves dramatically through the tracery of Gothic windows. You then see that only the tower and steeple of the church are unbroken; the remainder of the church is a ruined shell inside a carefully tended garden. 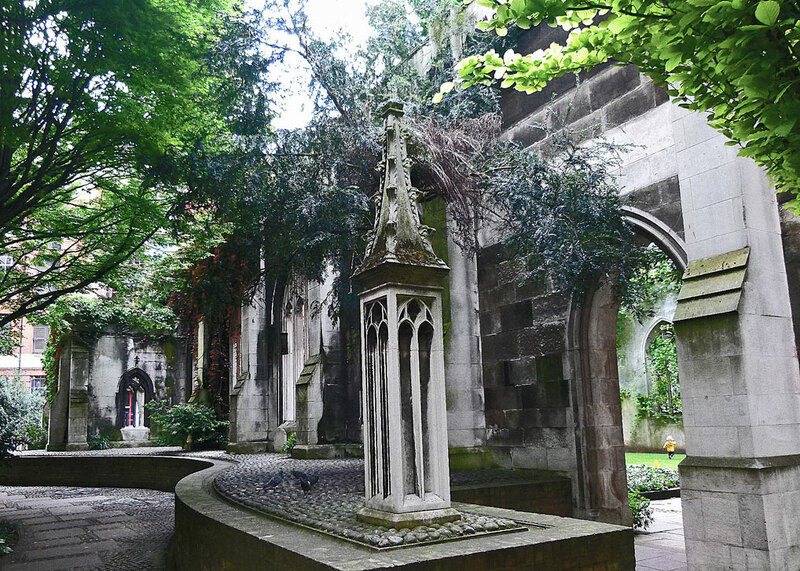 Depending on the time of day, year, the light and your mood, St Dunstan in the East either looks softly romantic, or a tiny bit creepy. Dunstan in the East dates from the 12th century but, like all of London’s ancient churches, it was tested by fire and aerial bombardment. Severely damaged in the Great Fire of 1666, it was repaired and Christopher Wren gave it a new tower and steeple. 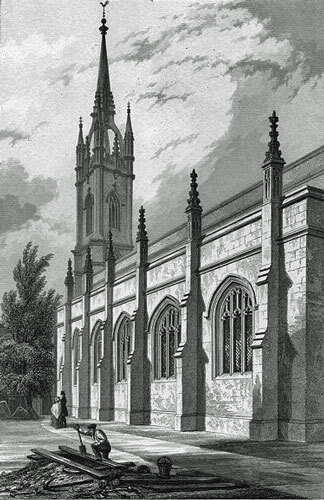 It then fell into decline and, apart from Wren’s tower and steeple, was rebuilt between 1817 and 1821. In 1941, during London’s Blitz, Dunstan in the East was destroyed by German bombs, and after the war the decision was taken not to rebuild. In 1967, the City of London undertook to open it as a garden, which it did in 1970. And now it provides a tranquil spot for City workers to munch their lunchtime sandwiches; they could probably sell seats – but it’s quieter at weekends. When I was there, it had been taken over by a young lad conducting a tour. He was quite good, and I hope he makes a decent living; but he does need to remember it’s a public place and be more succinct in future. I know you’re busting to ask whether there is a St Dunstan in the West: there is; it is in Fleet Street. You might also read that Dunstan in the East has Saxon origins. I could find no reliable reference to this and suspect that people get confused with the church of St Dunstan and All Saints in Stepney, which dates from at least the 10th century and is said to have been rebuilt by St Dunstan himself. St Dunstan was once one of England’s most popular saints and an interesting chap, a polymath described on the British Library’s blog as “a kind of Anglo-Saxon Renaissance man.” He was born in the early 10th century, possibly in the tiny village of Baltonsborough in Somerset, and went on to become Abbot of Glastonbury, Bishop of Worcester, Bishop of London, Archbishop of Canterbury and advisor to kings. A scholar, artist, musician, jeweller, metal smith and all-round craftsman, he is reputed to have tweaked the Devil’s nose with a pair of hot blacksmiths’ tongs. The story I particularly like about Dunstan is that he is said to have found King Eadwig (or Edwy) in bed with an attractive young lady, when he was supposed to be at his own coronation. Be fair; it must have been a difficult choice for the young monarch to make. Dunstan in the East would once have been at the heart of a thriving community. Situated just by the river, I’m guessing it would have had some links with traders and, on Historic England’s website, there is a fascinating photograph of porters from nearby Billingsgate fish market giving presents of fish sometime in the 1930s. Standing in what would have been the nave, where benches and flowers have replaced pews and pulpit, it’s difficult to picture what it must have been like, with graceful arches, beautiful hanging lamps, light streaming in through the stained glass, memorials on the walls to the great and good of the parish; and that musty church smell. Presumably, some of the hundreds who must have been baptised, married and buried here over the centuries are still there, in the garden. Incidentally, one of the plants, according to the City of London’s website, is winter’s bark, or winter cinnamon, Drimys winteri, allegedly named after an Elizabethan sea-captain, John Winter. A native of South America, it has various medicinal properties and its leaves or bark (not sure which) were once eaten to help prevent scurvy. So, visit Dunstan in the East: go on – off you go. It is special, and an oasis (you know how I love clichés) amidst the hustle and bustle of the City. Check before making a special trip, however, because it is hired out for events and still used for the occasional service. An excellent use for a bombed church. I love your first photo and also the one with the plants festooning the tracery. My father was a novice friar (he left the friary before taking his final vows) and was given the name Dunstan. He lived at Hilfield Friary near Cerne Abbas and it was interesting for us children to hear our Dad (whose name was Leslie) being called Dunstan when we visited. It looks so lovely in these photographs. Interesting to read, thanks Mike. Wow – what a gem! Must visit Dunstan next time I’m in London. One of London’s green treasures. Leo remembers it from years ago when it was rather neglected, so good to see it cared for. I think it is great to have kept the ruins and turned it into a garden for “public” use rather than bulldoze it and build another tower. Oh – it is, CP! That’s one I missed when I lived in London. 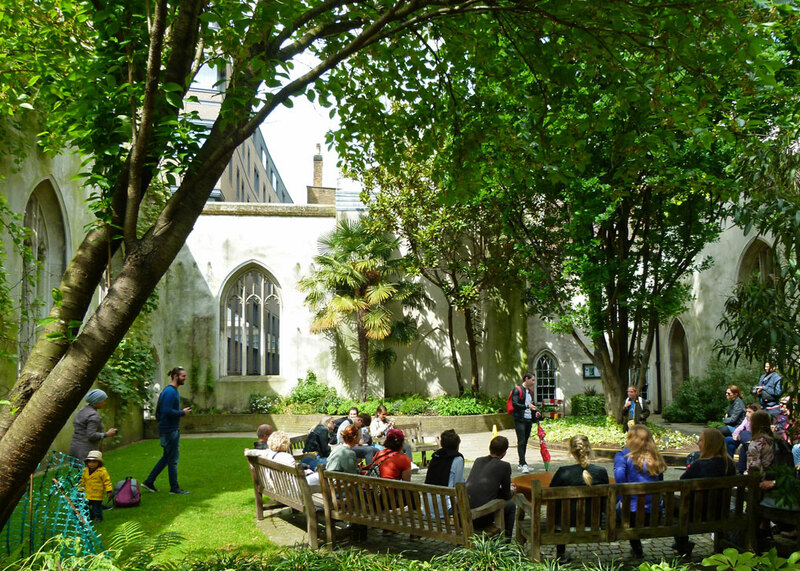 St Dunstan was the patron saint of goldsmiths. I’m not entirely sure why, since he was a silversmith. I get the impression he was pretty much an everythingsmith, April; but I guess it depends who you read! I researched it because I wanted to know which saint a goldsmith’s wife would call out to for help. Although St Elegius has a more dramatic name, he was French, which wouldn’t do. So it’s St Dunstan who gets the poor woman’s prayers. I wish I had visited it when in London! Next time! Oh, come on, Mike – the rest of the story, please! Dunstan found the king in bed, and then, what? Gee!! Anyway, my immediate impression of the first photo was, what a lovely, cool and green spot. No wonder it’s popular. Thanks for sharing. I think the king got upset and Dunstan was banished, Lisa. That’s what I would have done, anyway! An oasis…one should never be afraid to use the perfect word! I haven’t seen this yet but I do know about it! Hope to get there one day! Thank you for another fascinating insight into one of London’s hidden gems. Now that’s what I call a garden ornament! Better than a gnome any day. A romantic ruin in the Victorian style. Pity about the giant speaker box (computer tower?) looming over it in the last shot. In its middle Eastern origins, a walled enclosure – usually the construct for a garden in arid climates – is the source of our word paradise. Using the remains of a church as walled garden enclosure seems totally appropriate. Even better, in my view, would be to build it that way in the first place – but that’s just me. Thanks for the glimpse of a small paradise. I didn’t know that, Mark. How did we miss this when we stayed near Tower Hill in 2014? We did visit another church like this near the museum of London. Can’t recall the name but there were memorials to heroes there if memory serves me. That sounds like Postman’s Park, Marcia. A very good use for the place! There are so many hidden gardens scattered everywhere in the City. Let me get you a map, it’s a fun thing to do. Very interesting. I found a bombed out church in Liverpool that was not rebuilt but turned into a garden and place for special occasions like weddings. I found it very tranquil and could still smell the burnt timbers, or was that my imagination. I keep meaning to do a feature on Portsmouth’s Royal Garrison Church – similar thing, though part of is still in use. It looks lovely in your photo’s, and the history is fascinating. Fascinating. Love how you captured the bride in her magical moment as a royal princess. Thank you – I didn’t want to intrude, so I hope she didn’t spot me. What an interesting read and some great photos!